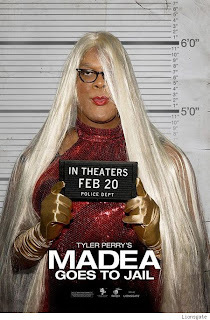 Hallelujer…Tyler Perry brings Madea back to the screen in his latest feature, MADEA GOES TO JAIL! Warning: Scenes with Madea will cause loud and uncontrollable outbursts of laughter. One would wonder, what type of trouble could a pistol-carrying, elderly woman, possibly get herself in that would land her in all places, JAIL!! Well, let’s just say, after yet another run-in with the “po-po’s,” Madea has exhausted all of her life-lines, tap-danced on the wrong judge’s nerves and ends up serving time in jail. Derek Luke (Notorious, Antwone Fisher) co-stars in the film as, Josh Hardaway, a rising Asst. District Attorney who takes on a case involving a young drugged-out prostitute, Candace Washington, played by Keshia Knight Pulliam (Cosby Show, The Gospel). As Candace’s case continues to build, Josh starts to feel responsible and connected to Candace’s struggle, so rather than allow his inner conflicts to become tangled in the court preceding, he passes the case on to his female colleague, Linda Holmes (Ion Overman), who also happens to be his fiancée. While in jail, Candace encounters, Madea who dishes out wisdom and encouragement to her, all while serving as a source of comfort and strength. At the film’s press junket in Beverly Hills, Keisha Knight Pulliam shared insight on her experience playing a prostitute--a far cry from her role as the youngest, Huxtable on The Cosby Show, “it was the biggest stretch and the hardest I’ve had to work at a character and a role, and that’s really why I took it, because I wanted that challenge. Honestly, at the end of the day, she’s [Candace] like everyone of us, it’s about choices- it was door A or door B, and sometimes when you choose door B, it will take you down a path that’s a life altering path. But I think the story behind her is we all have choices, and no matter how bad or destitute the situation is, there’s always a way back,” she says. I had a few minor issues with character development and at times found myself wondering why Tyler did or did not make certain choices in moving the film forward. There was however, a great scene with Josh and Academy Award nominated actress, Viola Davis who played Ellen, a counselor to abused women that really stood out and struck an emotional chord. But it was the larger than life presence of Madea that was truly delightful and tightened up laugh muscles I hadn’t used since Madea made her last on-screen appearance in Madea’s Family Reunion. Since there’s always room for improvement and I assume everyone believes that—including the proven successful Tyler Perry, I decided to enjoy Tyler’s intended purpose of the film--to make people laugh, and laugh I did- and out loud too—many times--with no restrictions. I recommend this film to anyone who needs to LOL! See it with friends and family--in theaters only! Are you waiting for a comedy movie if then Tyler Perry's Madea Goes to Jail (2009) is a best choice for you. I have seen this on several times now. This time our big fat lady goes high speed and going to jail. Even in jail he makes it comfortable for every one around. Free movies http://www.80millionmoviesfree.com I watch it and hope it will grow up in coming days.